The Counter Extremism Project (CEP) reports weekly on the methods used by extremists to exploit the Internet and social media platforms to recruit followers and incite violence. 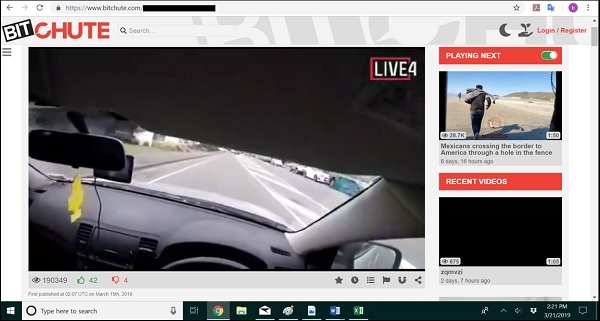 This week’s edition spotlights the tech companies that allowed the Christchurch terrorist’s live-streamed attack to remain online for over a week and allowed reuploads of the deleted video. Additionally, it chronicles the online resurgence of white supremacist groups, such as Atomwaffen Division and Identity Evropa. 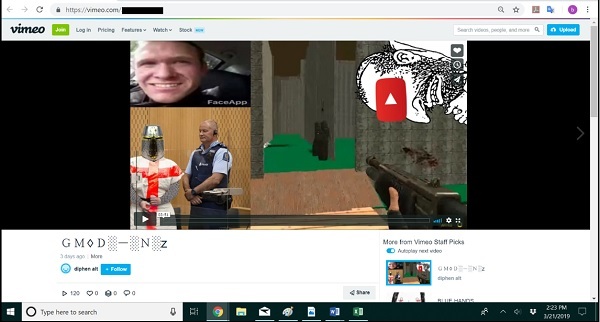 Copies of the video made by the alleged Christchurch terrorist Brenton Tarrant are widely available online a week after he live-streamed the attack on Facebook. As of March 21, CEP researchers located 17 active links for the full video on 14 different websites: the Internet Archive, Megaupload.nz, BitChute, Deposit Files, Send Space, Zippyshare, Tus Files, Anonfile, Leekwire, Gulfupload, Gogman, darkweb.tokyo (accessible through the Internet Archive’s Wayback Machine), theync and Amerika.org. Additionally, a permanent torrent file for the full video (and the manifesto) were located on the notorious neo-Nazi website The Daily Stormer. One version of the full video on the streaming site BitChute was uploaded on March 15 and had over 190,000 views as of March 21. Full video on BitChute. March 21, 2019. 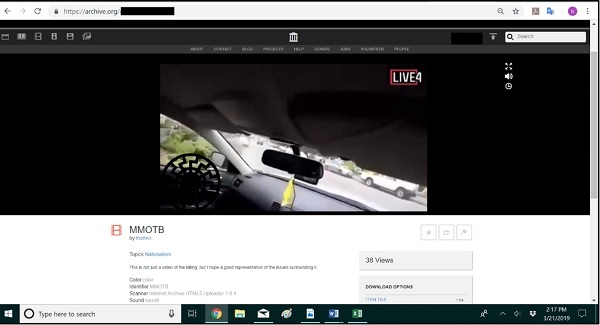 Clips of the video, ranging from 30 seconds to over eight minutes long, were located on nine sites: Twitter, Google Drive, the Internet Archive, BitChute, Discord (download file), 4chan, 8chan, Catbox and Anonfile. Clips included unchanged segments taken from the video or, in some cases, sections of the video modified with added audio or video. Clip on the Internet Archive. March 21, 2019. The introduction to one of the videogame recreation videos on Vimeo. March 21, 2019. 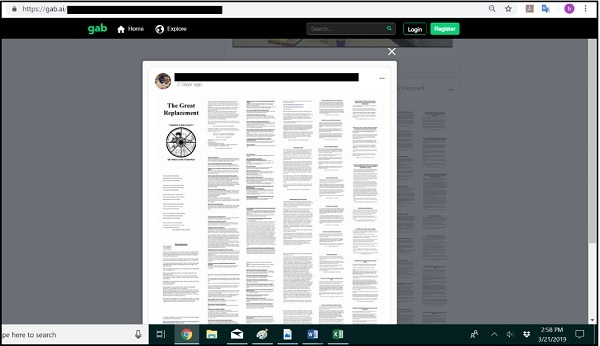 Brenton Tarrant’s manifesto is available on at least ten websites: Gab, Pastebin, the Internet Archive, Freepdf, Deposit Files, Send Space, Zippy Share, Tus Files, Mirror Ace and on a WordPress blog. The manifesto is also available as a permanent torrent file on the notorious neo-Nazi website The Daily Stormer. The manifesto posted on a Gab profile. March 21, 2019. 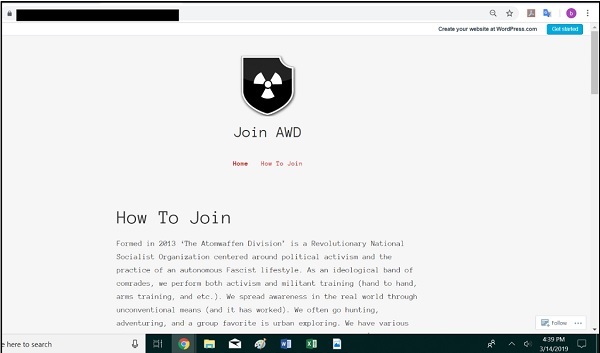 A recruiting website for the Atomwaffen Division was located on the .blog domain. The site states, “[w]e have absolutely no room for moderates and cowards … There is nothing that can be fixed in a system so inherently flawed, National Socialism is the only solution to reclaim dominion over what belong (sic) to us.” The website also encourages leaderless resistance. There is little information available via WhoIS for privacy reasons, however Automattic is listed as the name server. Automattic, the owner of WordPress, has previously ceased providing services to Atomwaffen Division websites, as well as those of similar groups. The site is no longer online as of March 22, 2019. Atomwaffen Division website. March 14, 2019. The white supremacist group Identity Evropa has rebranded itself as the American Identity Movement (AIM). Identity Evropa and now AIM have are part of the “identitarian” movement, originally a European movement known for advocating for white supremacy and ethnocentrism. Identity Evropa has previously focused on building a national movement and recruiting on college campuses. AIM claims adherence to five principles: “nationalism, identitarianism, non-interventionism, protectionism, and populism.” Recent leaks of Identity Evropa chatlogs by the website Unicorn Riot showed that while the group attempted to have a polished, non-violent image, the group at its core advocated racism and anti-Semitism, and members praised violence such as the massacre committed by Dylann Roof. AIM’s rebranding is another attempt for white supremacists to attempt to portray themselves as a respectable political movement. AIM has launched a website to spread their message, recruit and sell merchandise. The website uses Namecheap as its registrar and Cloudflare as its name server. The group also has Instagram, Twitter and YouTube accounts. Identity Evropa claimed their YouTube account was suspended in August 2018. 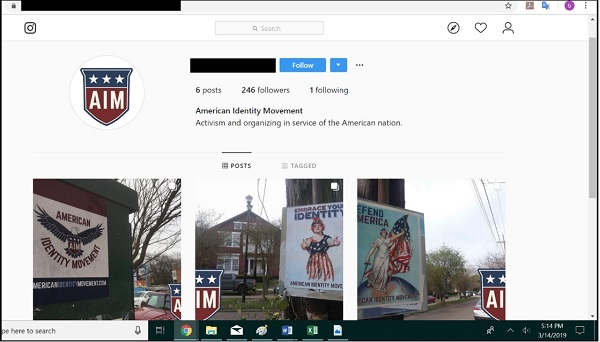 American Identity Movement Instagram account. March 14, 2019.